Distance in my mind is not about power, its about leverage and form. Your form is key. You cannot have an unnecessary motion in your swing, if so you're losing precious power. So get your form down first then work on the rest. Reach back as far as is comfortable: the longer your swing is the more leverage you'll have against the disc, which creates more snap which equals more distance. Teammate Jim Davidson and I like to play a point system game using cones. Get 4 cones, place one of them where you are like a tee box, the other 3 at different distances For example 150, 280, 375 feet. Throw three discs at each target for a total of nine throws, every disc within 30 ft of its intended target counts as a point, add up your score, then try to best that score every next time you play it. Also, practice putting everyday if possible. I putt at least once a day, sometimes multiple sessions, and my putting has improved tenfold. One of the most important things in disc golf is your grip. 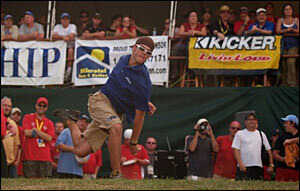 How you hold the disc is a key essential to success. You have to make sure your grip is comfortable for you, and only you. 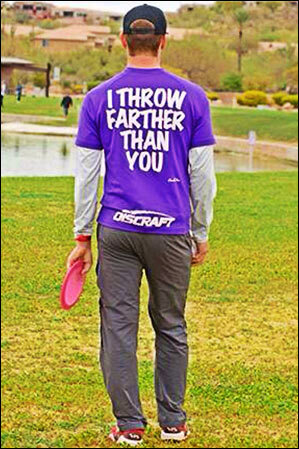 If you can't throw the disc with some crazy grip someone told you then don't use it. How does someone try and tell you how to hold the disc?? Let your natural instincts take over and go with what you feel, and what feels comfortable. Unofficially breaking the Guts World Speed Record with my throw of 134 kph. My goal is to make it official this year. (173-174 gm) The Force is a money disc and my go to driver. Every time I throw it all I see are dollar signs. The Force goes bigger than anything in my bag, super huge hyzer flips and big turnover lines, also have a beat one for super long rollers 500+ feet. (173-174 gm) I carry a beefy Predator at all times. Great utility disc. My Newest Z is for big hyzers and head winds. Beat-in Z is for flat hyzers and soft flex shots. Chewed up Z is for big flex shots. I use the ESP for thumbers and overhand shots and my other for big distance shots. The Predator is a very great disc, super fast and super beefy, great for long hyzer shots. (173-174 gm) The Avenger is my turnover driver. I use it for straight shot and left to right drives, its great for low ceiling because the Avenger has great speed. (174 gm) The Avenger SS is my roller disc. It's great for any type of roller shot, or nice soft finesse shots. (173-174 gm) I throw Tracker on straight, left finish shots 300-400. A super controllable fairway driver. (174 gm) Best midrange there is, period. A super straight flyer with a little bit of stability. (174-175 gm) I love the Meteor for all my left to right shots. This turn over approach disc is super controllable. (max weight) Best putter there is son! My putter and approach disc. Challenger also has the power to make it rain. Kansas City, MO One of the longest courses -- if not the longest -- in the US. Awesome elevation, lush fairways. Rock Hill, SC USDGC layout is unbelievable, I love OB rope mixed with the distance and accuracy. Portland, OR Beautiful course, lush green fairways, towering tall trees. Waco, TX The Beast gets its nickname from chewing up golfers and spitting them out! Tight tuff woods mixed with long open crushes. 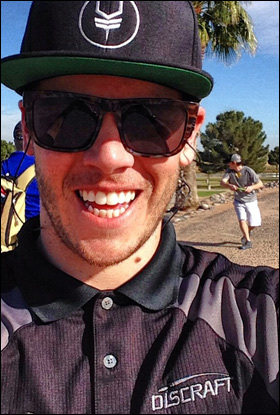 Phoenix, AZ Sweet course, beautiful scenery, plays around a sick lake, where bad shots are punished.